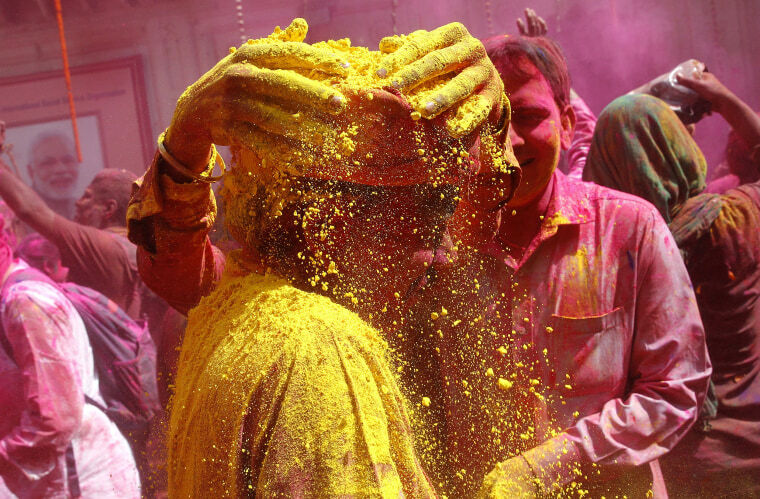 While its roots are religious, tied to the god Krishna, Holi is also seen as a celebration of good versus evil, and of a good harvest. 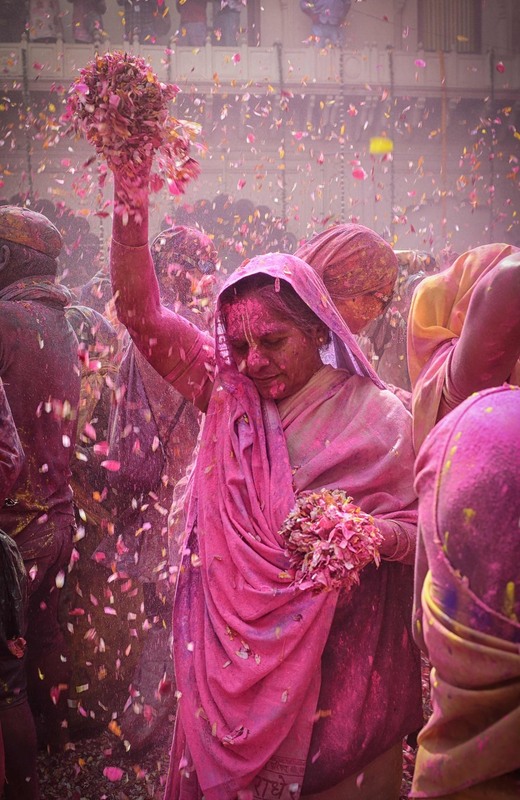 An Indian widow dances covered in colored powder while holding flower petals during Holi festival celebrations in Vrindavan, India on Feb. 27, 2018. 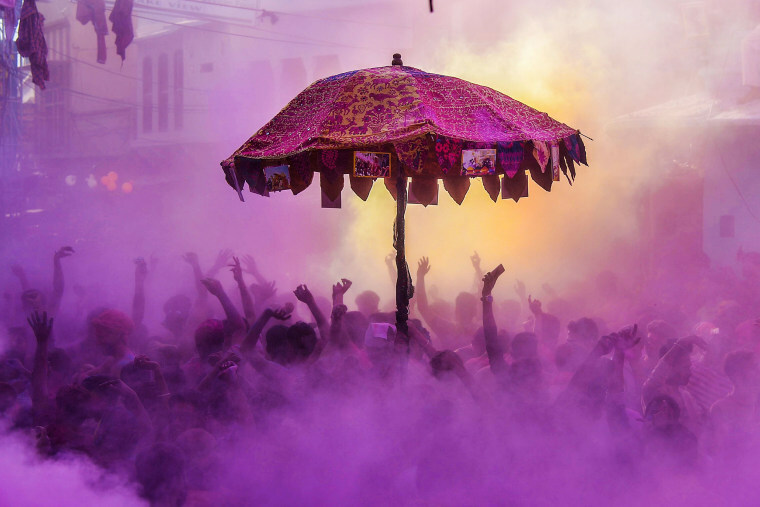 Holi, the popular Hindu spring festival of colors is observed in India at the end of the winter season on the last full moon of the lunar month. 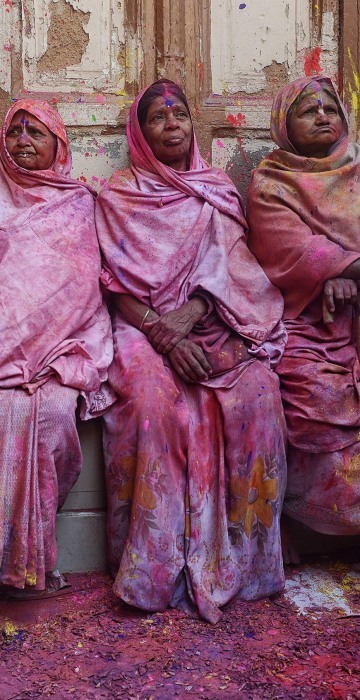 Thousands of widows from Vrindavan and Varanasi mark the Hindu spring festival at a temple to break a hundred-year-old taboo of celebrating the Holi festival; in many parts of India widows are still not allowed to celebrate Holi and participate in festivals. The event was organized by Indian NGO Sulabh International that is trying to improve conditions for widows in India. 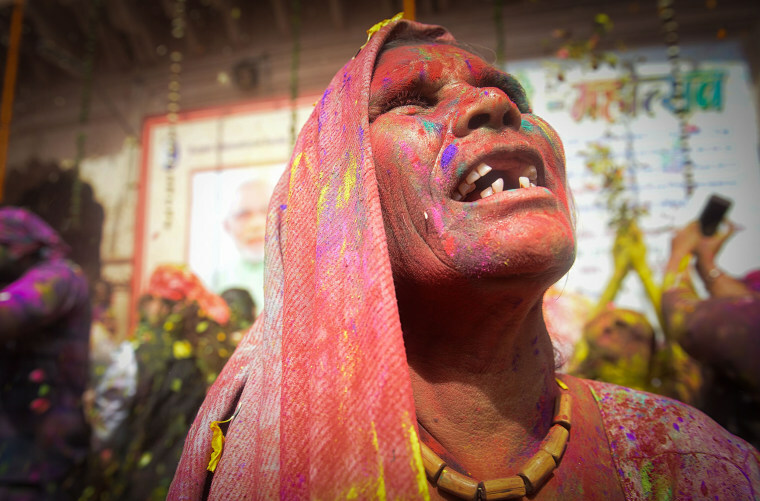 Indian devotees and foreign tourists take part in the "kapda phaar," or cloth tearing, during festival celebrations in Pushkar, Rajasthan on March 2. 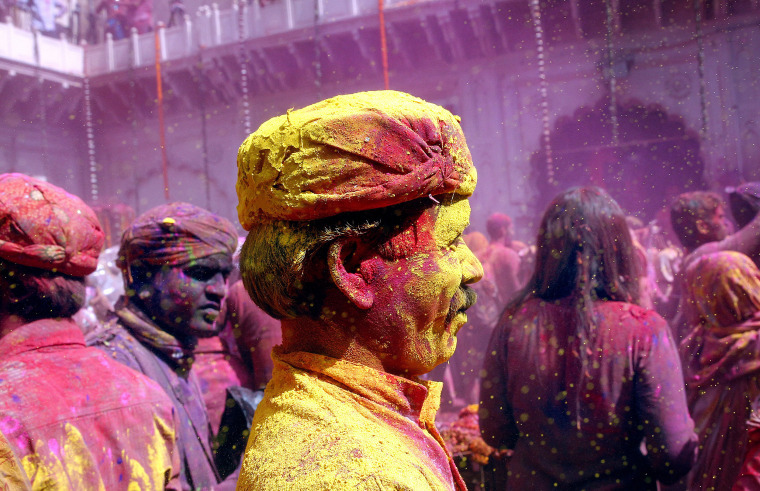 People throw colored powder in Vrindavan, Uttar Pradesh on Feb. 27. 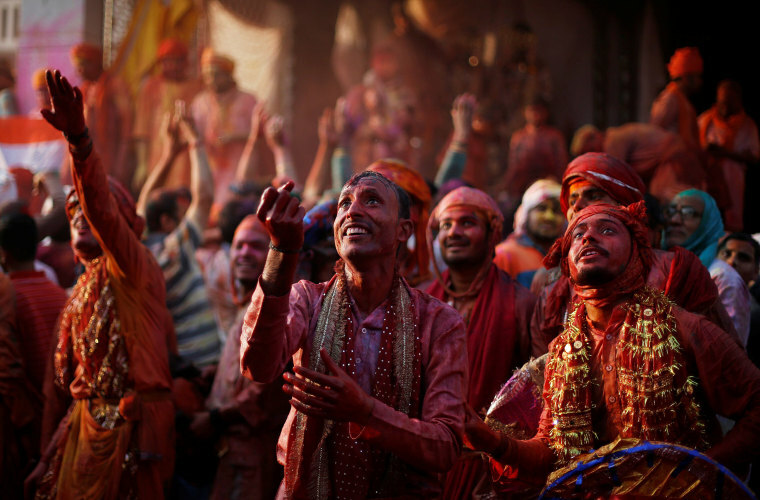 Hindu devotees take part in the religious festival inside a temple in Nandgaon village, Uttar Pradesh, on Feb. 25. 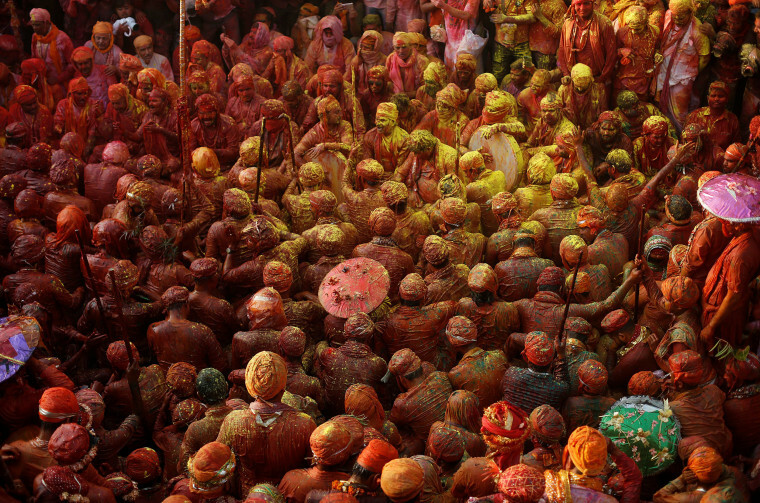 A mass of people inside the temple in Nandgaon village on Feb. 25. 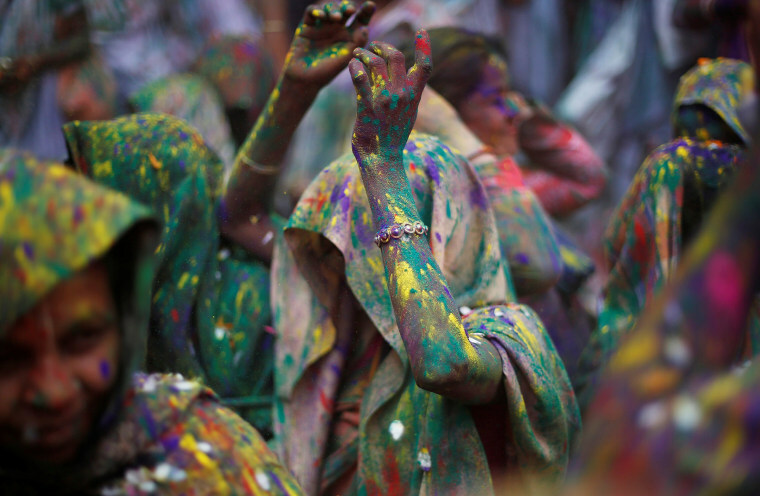 Indian students play with colored powders in Kolkata on March 1. 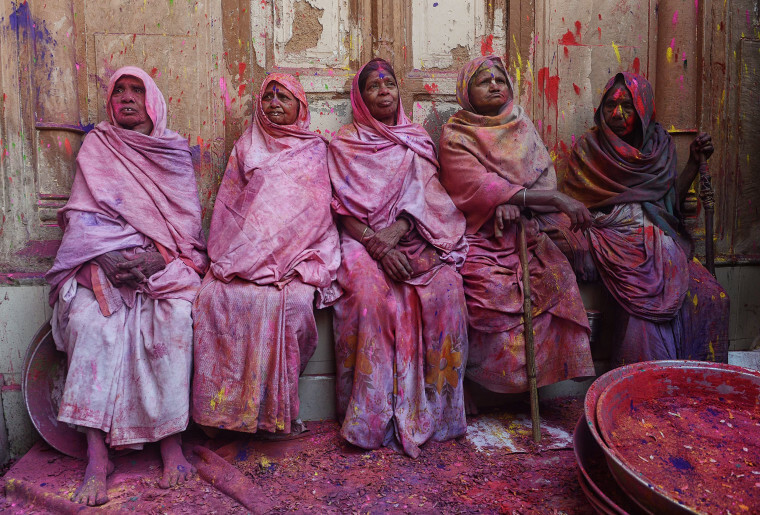 Indian widows covered in colored powder sit aside watching others dance, in Vrindavan, Uttar Pradesh, on Feb. 27. 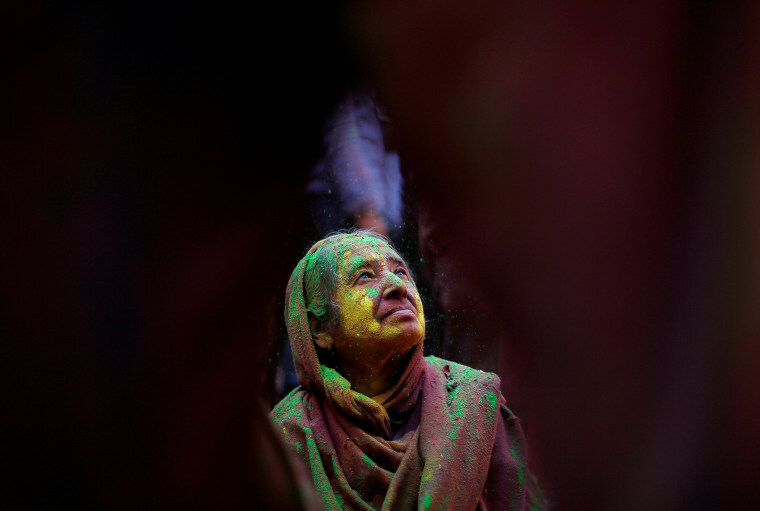 A widow covered in colored powder dances in Vrindavan, Uttar Pradesh, on Feb. 27. 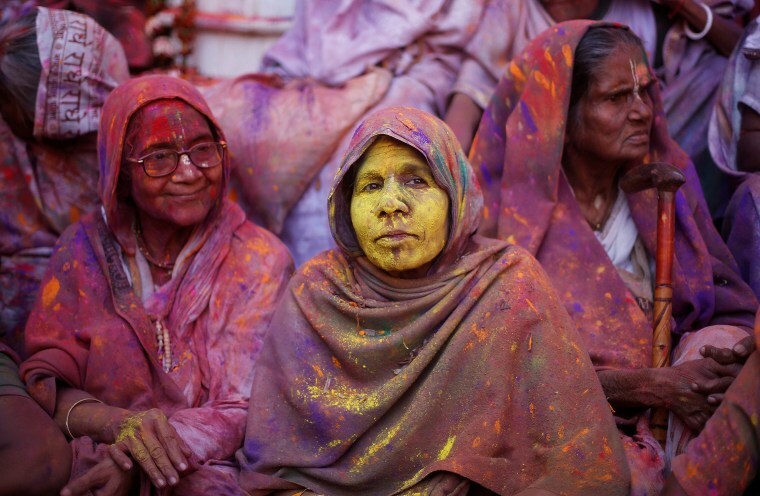 Widows covered in colors take part in celebrations in Vrindavan, Uttar Pradesh, on Feb. 27. 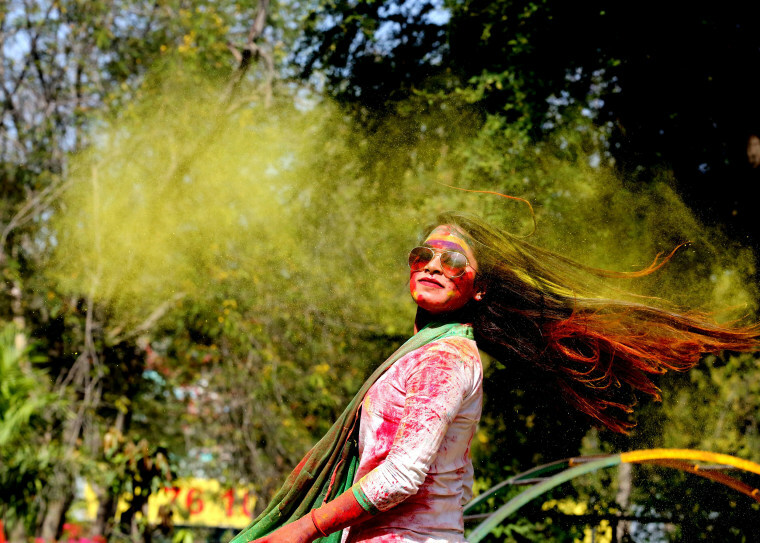 A college girl moves through a color cloud in Bhopal on Feb. 28. 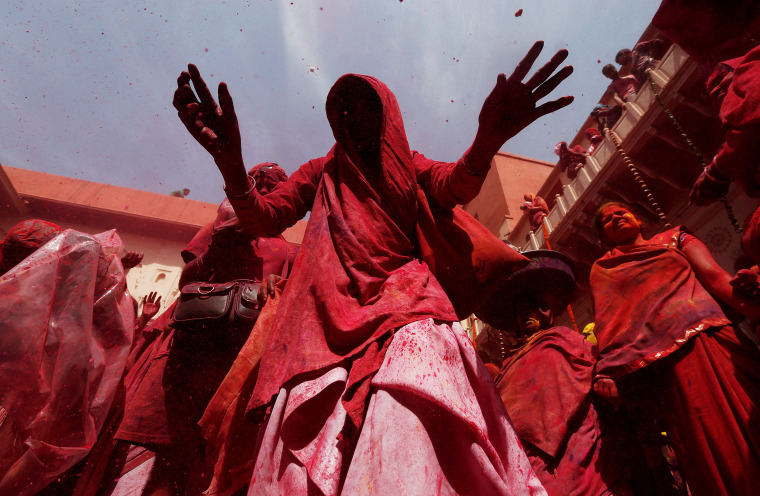 Widows covered in colored powders dance as they take part in celebrations in Vrindavan, Uttar Pradesh, on Feb. 27. 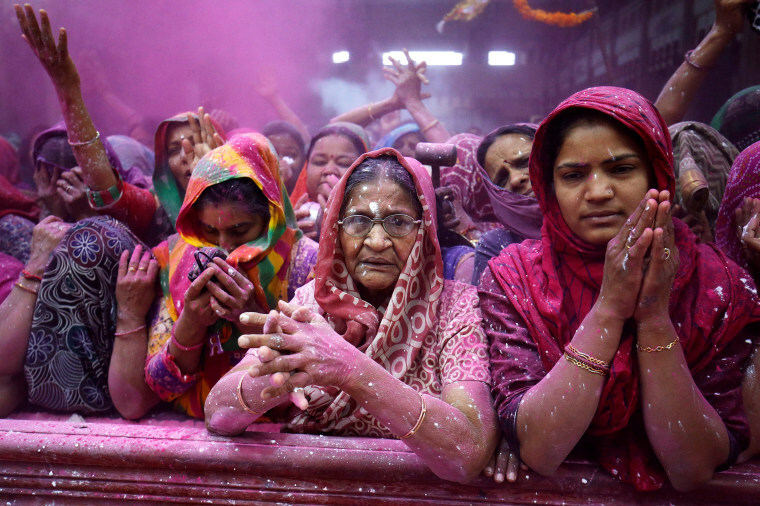 Women offer prayers inside a temple during celebrations in Ahmedabad, on March 1. 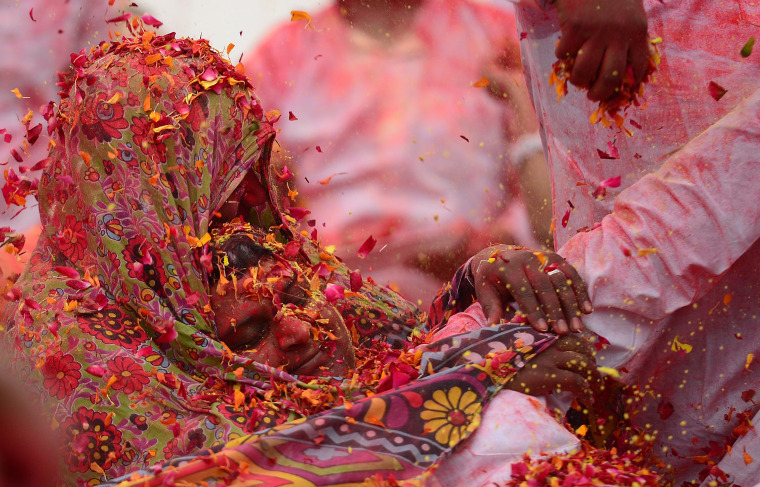 A widow doused in powders celebrates in Vrindavan, Uttar Pradesh on Feb. 27. 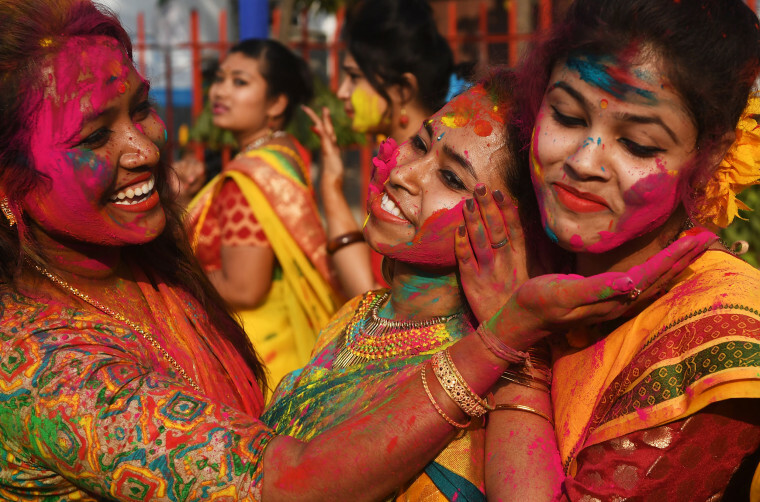 Indian students smear colored powder on each other in Kolkata on Feb. 26. Widows dance as they take part in celebrations in Vrindavan, Uttar Pradesh on Feb. 27. 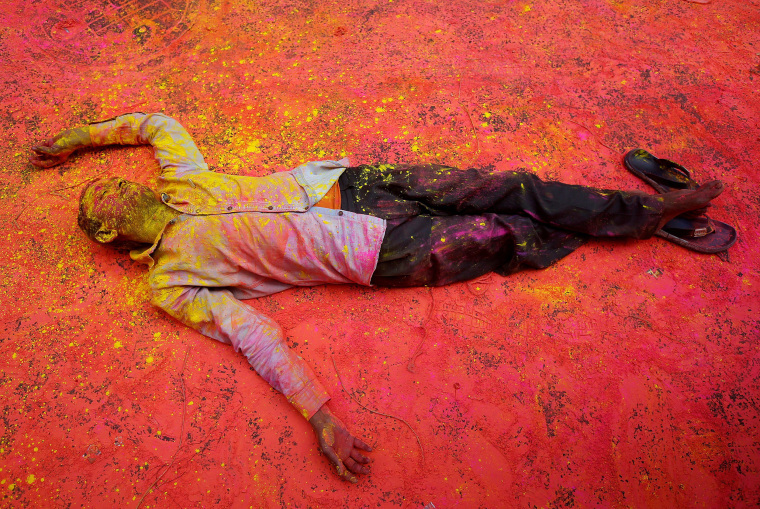 A Hindu devotee smeared in colored powder takes a rest on a road during a procession in Kolkata on Feb. 28. 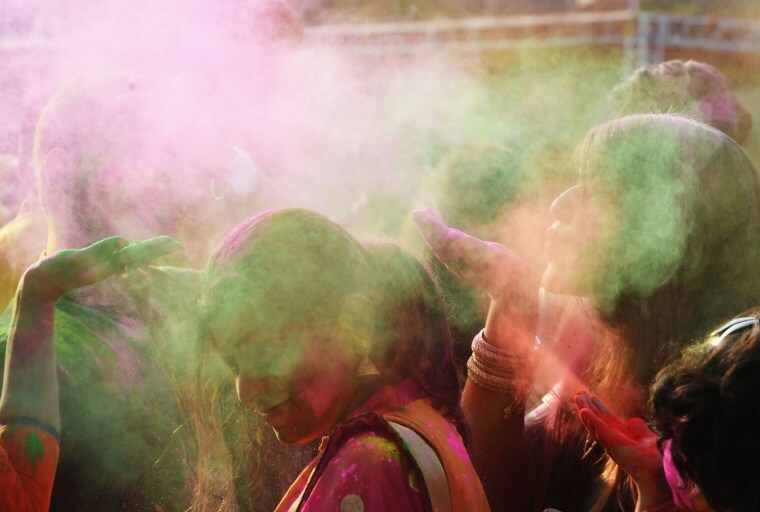 Indian college students throw powder at one another during celebrations in Bhopal on Feb. 28. 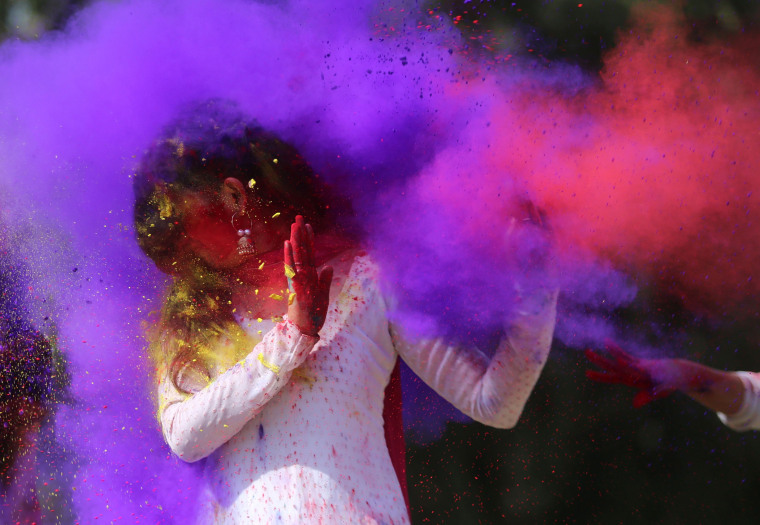 Flower petals and colored powder are thrown around at an event for children with cerebral palsy, organized by the Trishla Foundation, in Allahabad on Feb. 25. 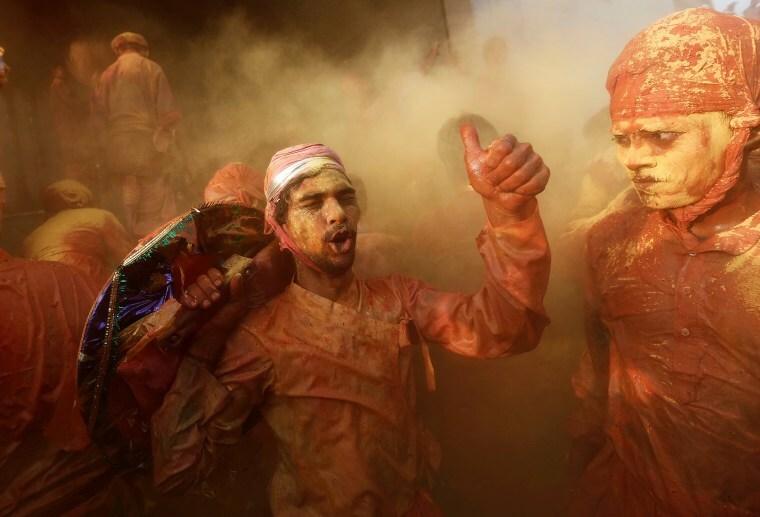 Hindu devotees take part in the religious festival inside a temple in Nandgaon, Uttar Pradesh on Feb. 25. 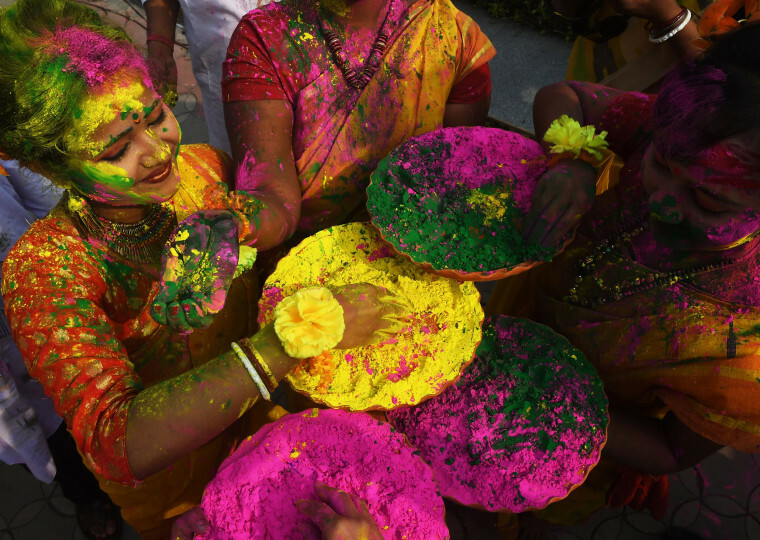 Indian students throw colored powder to celebrate in Kolkata on Feb. 26. 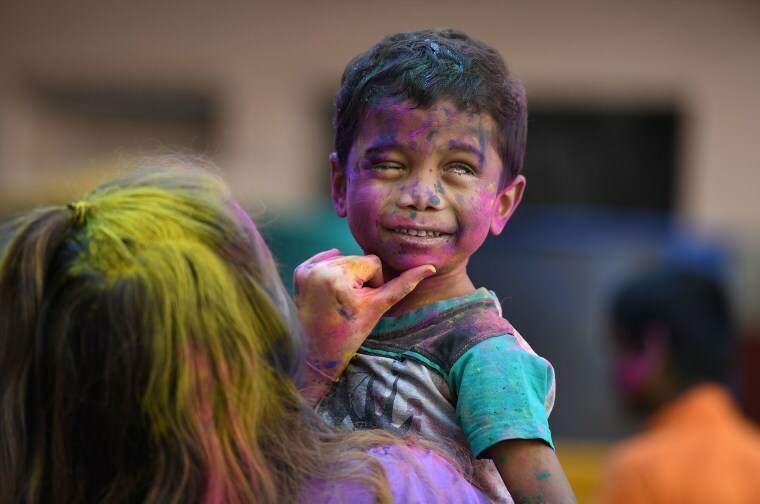 A visually impaired Indian boy from the Devnar School for the Blind gets colored powder put on his face as the school celebrated in Hyderabad on March 1. 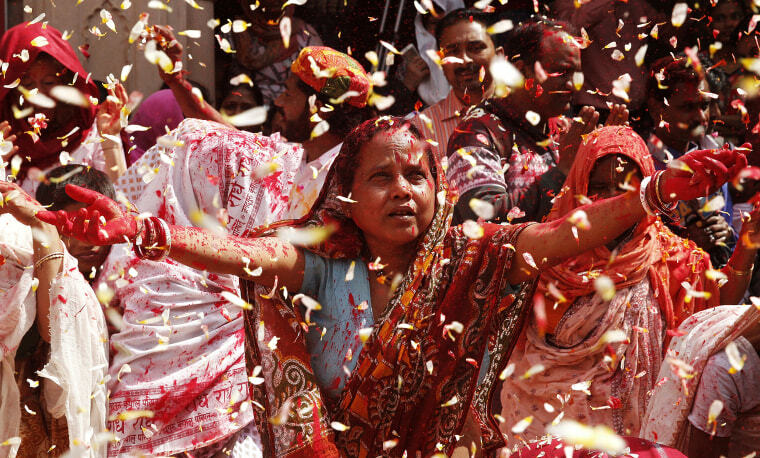 Indian widows throw petals in Vrindavan, Uttar Pradesh on Feb. 27. 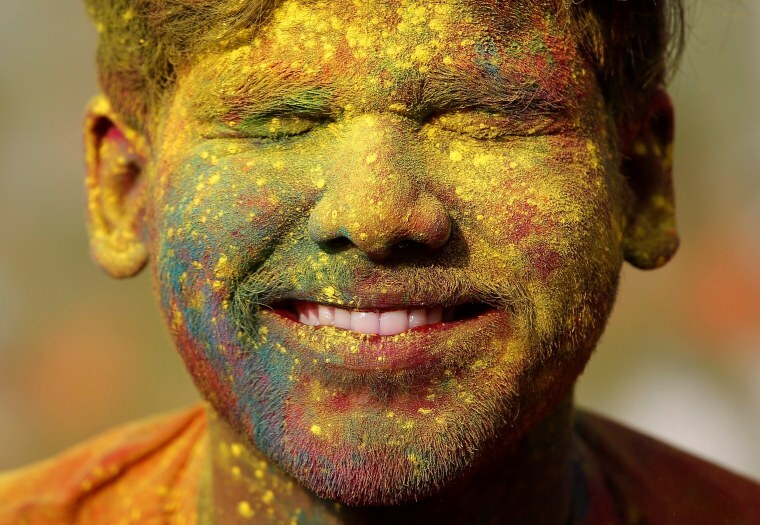 A student of Rabindra Bharati University, with his face smeared in colored powder, reacts as his fellow student throws colored powder on his face during celebrations inside the university campus in Kolkata on Feb. 26. 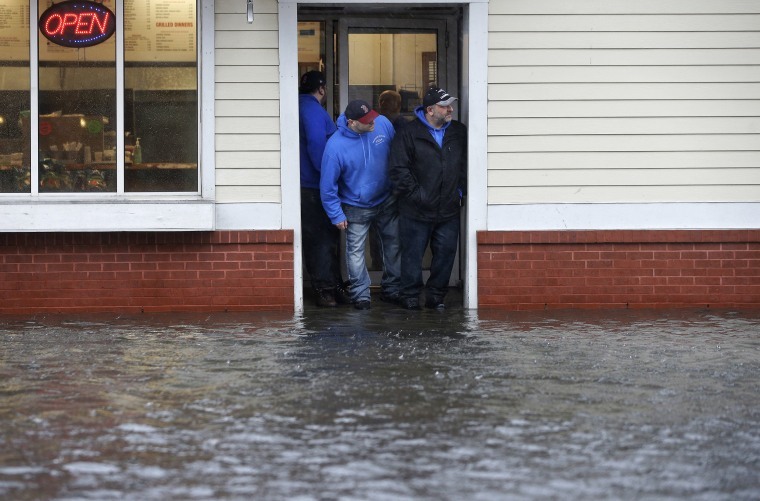 People stand at the entrance to a pizza shop as water floods a street on March 2, 2018 in Scituate, Mass. 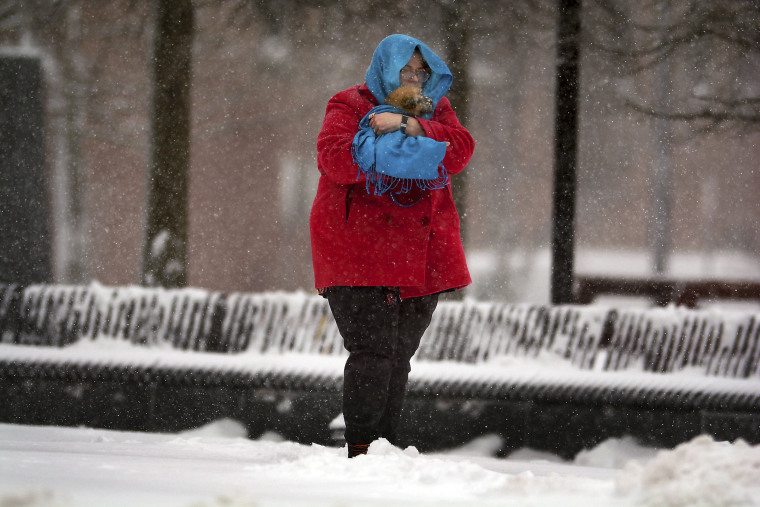 A major nor'easter pounded the East Coast today, packing heavy rain and strong winds as residents from the mid-Atlantic to Maine braced for coastal flooding. 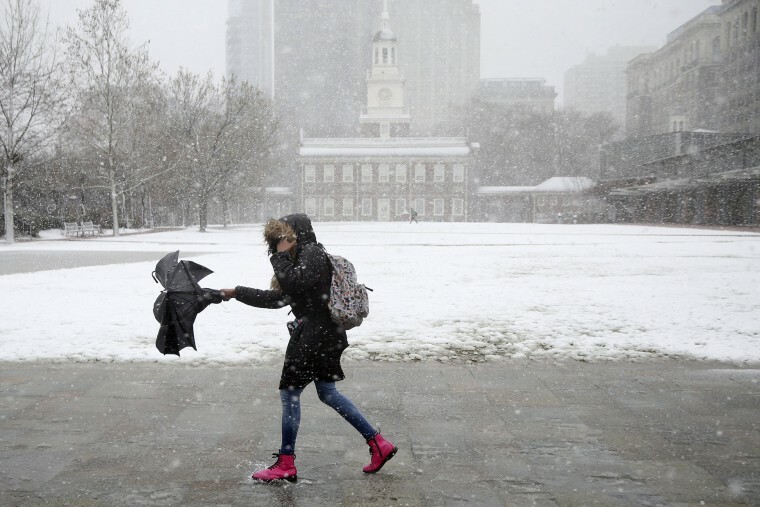 Walking past Independence Hall, a woman braves the snow and wind along Market Street in Philadelphia. 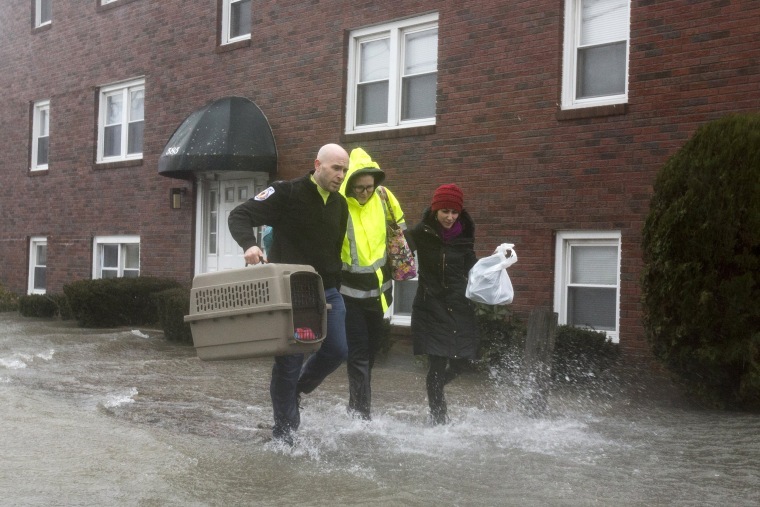 A woman holds a small dog as she walks in downtown Scranton, Pa.
A rescue worker helps carry a rescued animal away from a flooded apartment building as the Hough's Neck area is flooded due to a strong coastal storm in Quincy, Massachusetts. 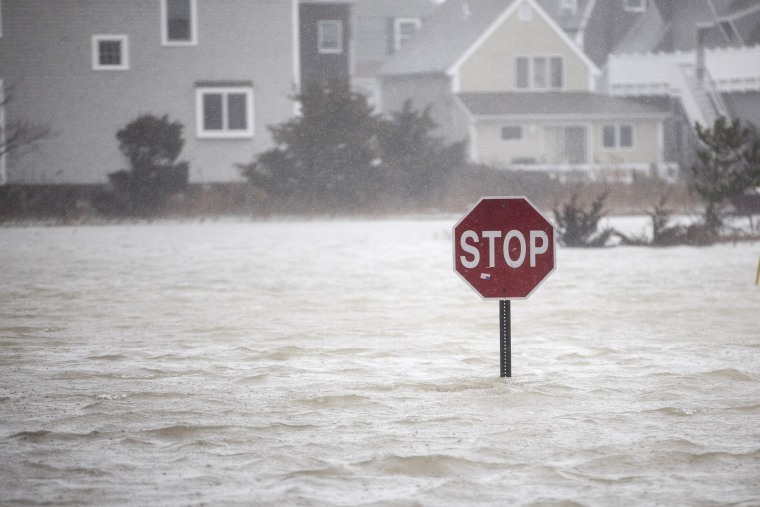 A stop sign is shown submerged by flood water as a large coastal storm bears down on the region in Scituate, Massachusetts. 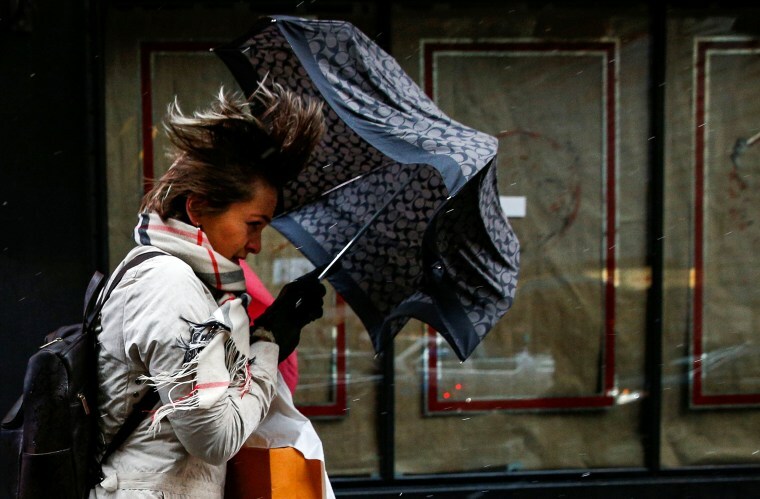 A pedestrian walks through Times Square during a windy winter nor'easter in New York City. 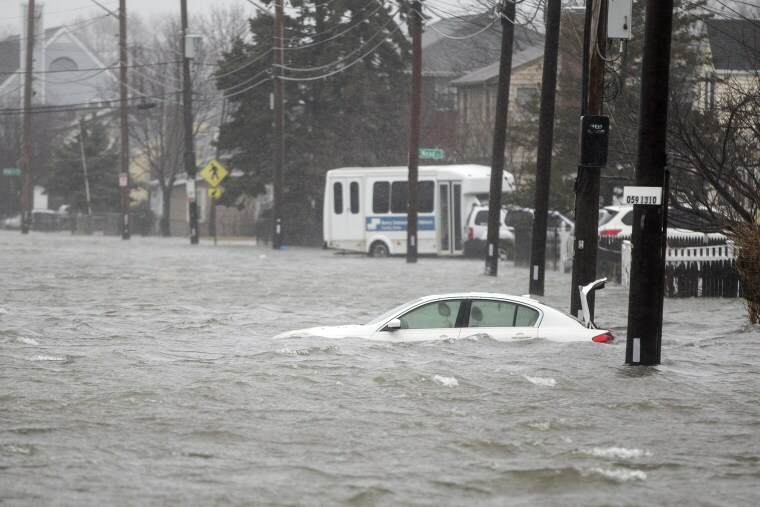 A flooded car in the Hough's Neck area is shown due to a strong coastal storm in Quincy, Massachusetts. 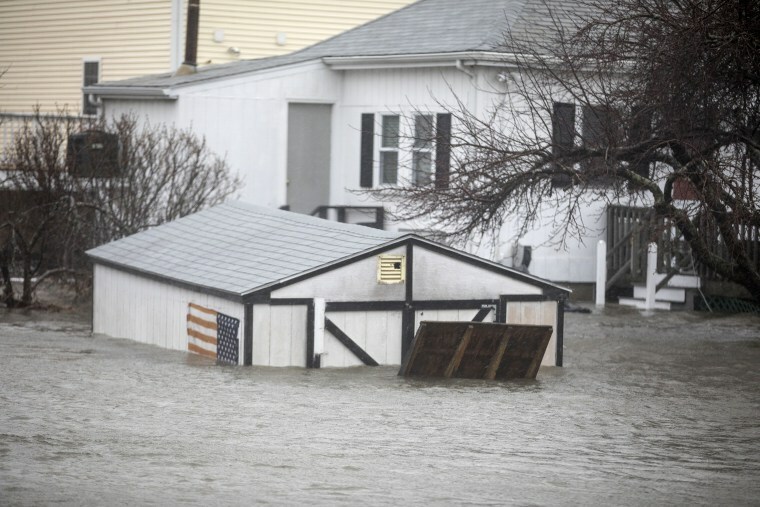 A flooded shed and home due to a strong coastal storm are seen in Quincy, Massachusetts. 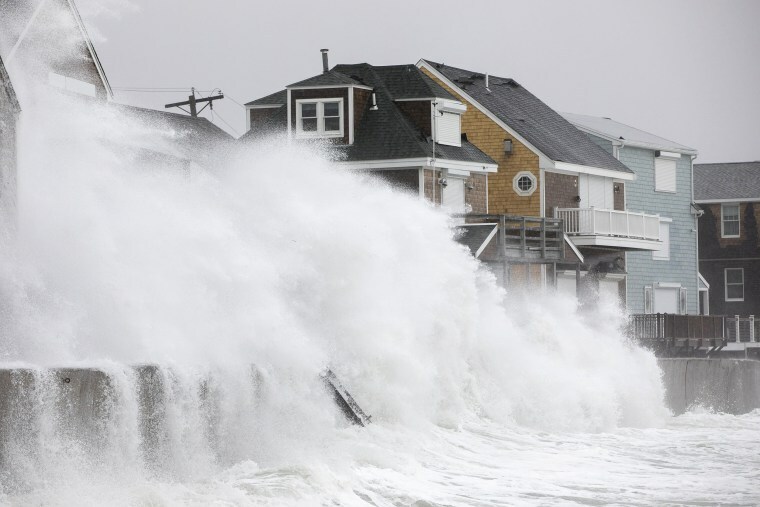 Waves crash over houses on Turner Rd. 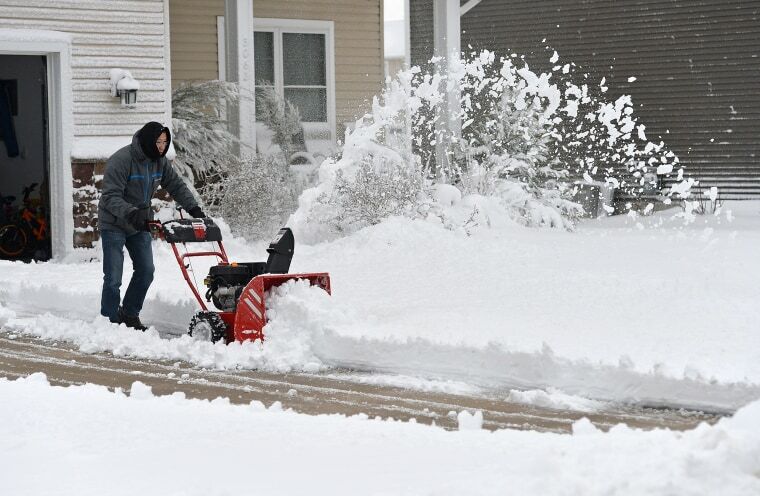 as a large coastal storm affects the area in Scituate, Massachusetts. 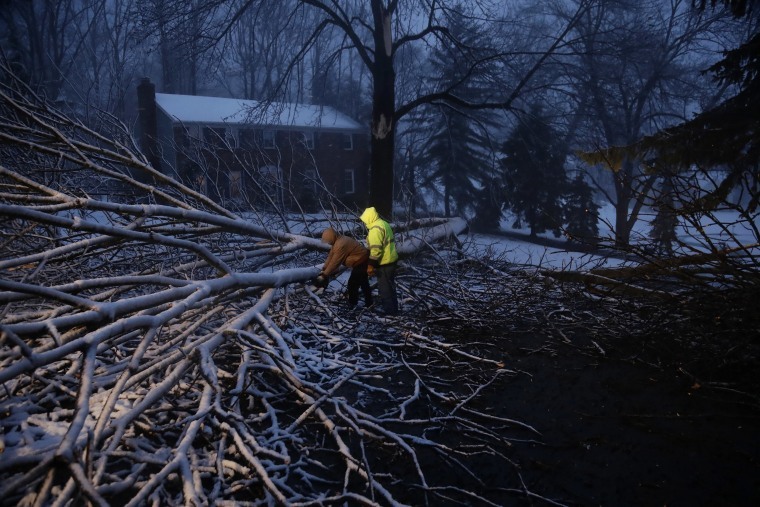 Streets department workers David Boardly, from left, and James Ockimey clear a downed tree during a winter storm in Marple Township, Pa.
Bernie Zhou uses a snow thrower to clear snow from his driveway in the 5000 block of Magnolia Bend in Fairview Township, Pa. 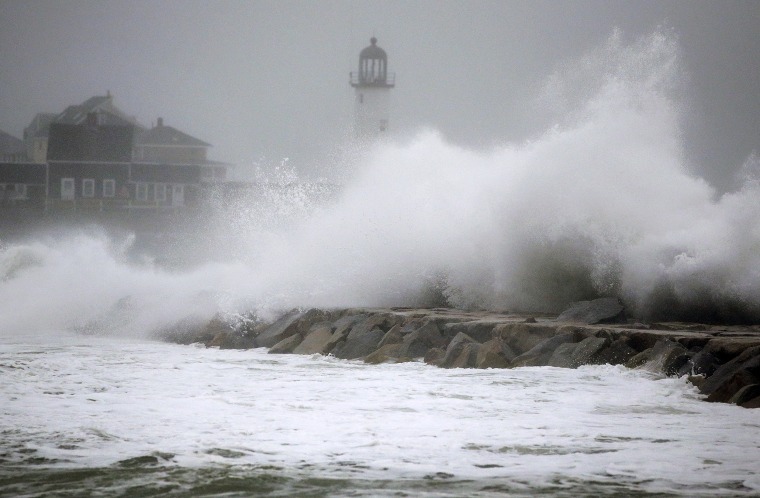 Waves crash against a seawall near the Scituate Lighthouse in Scituate, Massachusetts.